Have you ever ventured out on a path that you felt God wanted you to take, not really knowing where it was headed? But after traveling, for what might have seemed like an endless (or pointless) journey, you looked back at the pathway behind you and remembered God’s hand guiding you every few steps. And ahead of you, off in the distance, with a narrowing of your eyes to gain a clearer view, you begin to see it–the destination. And in that enlightened moment the long, arduous trip begins to make sense. I set out on a journey to write a book just about fifteen years ago with my friend, illusionist Toby Travis. 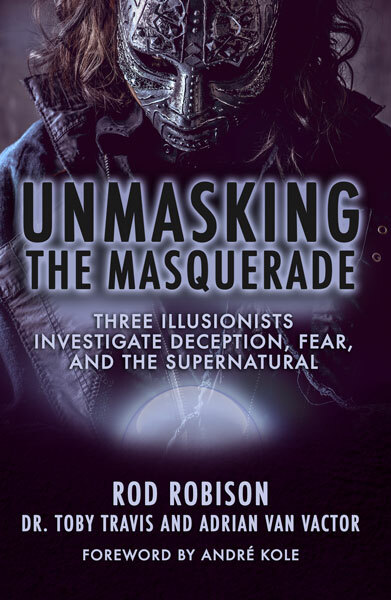 Unmasking the Masquerade: Three Illusionists Investigate Deception, Fear and the Supernatural was just published by Encourage Books this past January. (I’ll get to the third illusionist in a moment.) The pathway to publishing it was long, often frustrating, and at one point we put it on the shelf thinking that maybe it wasn’t worth the effort. Toby, who at the time was a widely traveled illusionist sharing the Gospel around the world, invited me to speak and perform at a symposium in London, England entitled, The Christian Consortium on the Paranormal. He and I had shared a common interest in exposing the deception and often deliberate trickery at the crux of alleged paranormal powers. We’d seen more than a few Christians deceived by those claiming such powers, and even some claiming to be Christians who were using deception to lead others to believe they had extra-sensory powers. We felt that a book exposing such deception to the light of truth would be of value to the Church. But well down the path we discovered that the book needed to offer much more than an exposure of deception. The London symposium was an opportunity for like-minded Christians, most of them magicians, to share thoughts on a biblical response to claims of the paranormal. It was held at the acclaimed Magic Circle Theater, an ornate and enchanting venue and home of the prestigious Magic Circle in Central London. One might say it’s the Magic Castle of Europe. It was a full day of papers presented, discussions conducted, and thoughts shared. That evening several of us performed to a packed house on the main stage. That one day launched the book project when Toby and I decided to combine efforts by using our white papers as the core of a book. We worked on the project in earnest for a year or so. Then, like a marathon runner hitting the proverbial wall, I was done. And so was Toby. I think we both sensed that it simply wasn’t the right time. We agreed to put the project on the shelf and wait. Maybe God would tell us when the time was right. Maybe there would never be a right time. And there the unfinished manuscript sat for ten years. I was okay with not finishing the book if that was what was best. Yet I never lost the conviction that there was a message that needed to be shared. Just not now. I wasn’t even sure why “just not now,” I just knew it. Then in the fall of 2015, I took my daughters to see hypnotist Michael Deschalit, a good friend from my hometown of Tucson. After his show he mentioned to me that he was self-publishing his books to which I responded, “Tell me more about self-publishing” – wondering if the time was right. A few days later we had a lunch, where I learned with him as the teacher, and me as the eager student, holding a tiny ember of publishing passion now beginning to flame up. Self-publishing had come very long ways since the infancy of the project and so I determined to complete the project and publish it myself using Amazon’s Create Space. “How hard can that be?” I reasoned. As it turned out, much harder than I imagined, especially with the many other arduous tasks involved in researching, writing, editing, rewrites, typesetting, and crowdfunding, all while holding down a full-time job. But God stepped in at just the right time to solve that problem. Several chapters of what was to become the first section of the book dealing with deception were already nearly completed including chapters on the Salem Witch Trials, the rise of psychic mediums in the past two hundred years, the strange relationship between Houdini and ardent spiritualist Sir Arthur Conan Doyle, my on-site investigation of psychic mediums and the tricks-of-the-trade I witnessed, and a few others. But there was so much more to research and write about. I contacted Toby who was by then living in Ecuador, having retired from itinerant ministry as a Christian illusionist, and transitioned to Christian education and consulting. He was working on his doctorate at the time so had virtually no time to work on the revived book project. But his already-completed manuscript “Whom Shall We Fear” was the perfect core for what would become the second section of three sections of the book. Toby’s section would focus the light of Scripture on the question, have we, as members of the Body of Christ, the Church, adopted more cultural depictions of Satan than scriptural? As I wrote in Unmasking the Masquerade: “Throughout the centuries and into our current age, folklore and popular, fanciful, Hollywood-esque notions of Satan have crept into our cultural ethos, often supplanting scriptural descriptions of him and his powers. When we, even inadvertently, assign to Satan more power than he has, we give him more power over our lives.” Toby, as a formally trained theologian and educator, had the deep biblical knowledge needed to tackle that sometimes controversial topic. With my section on deception and Toby’s on fear, especially as it relates to unfounded fear of Satan, the book was taking shape. But something was still missing. We didn’t want the book to be merely an expose of psychic deceivers and fear of Satan, as important as those topics are. We wanted the reader, after having learned about counterfeit miracle workers and Satan’s lies and deceptions, to be given a solid foundational knowledge of the real thing. For non-Christian readers, we wanted to introduce them to the verifiability of the written record of Jesus’ miracles, claims, and life-transforming power. For Christians we wanted to assure them of the validity of their faith. Enter international award-winning illusionist and apologist, Adrian Van Vactor. I’d known Adrian since he was fifteen years old and watched him mature into one of the nation’s most talented magicians. At age nineteen, he won two of the magic world’s most prestigious honors—The Milbourne Christopher Award, for the most promising young magician of the future, and the first annual Lance Burton Award. That same year he was on his way to a headline gig at Hollywood’s Magic Castle, driving west on I10, listening to a preacher on the radio, when Adrian surrendered his life to Christ. Having grown up in an atheist home and being a natural born skeptic, he spent the next few years examining the evidence to verify whether Jesus was a Myth, Magician, or Messiah – which, not coincidentally, is the title of one of his chapters. Adrian’s personal story, and his search for truth, formed the perfect backdrop for the final section of the book. Now we had our full circle themes to take the reader on a journey from deception to fear to the truth that overcomes both deception and fear. Those three sections are titled: Unmasking the Deception, Unmasking the Fear, and Unmasking the Miracles of Jesus. Researching and writing a 272 page book was a massive undertaking. But that was only part of the project. We still needed to get it edited, proofed, typeset, designed, and printed. And, frankly, it was more than I could do alone. The self-publishing route was simply not an option for me. A good friend and former employee of mine, Adam Colwell, stepped in to greatly improve the manuscript with his superior editing skills. I then needed someone to run the ball on most of the other above-mentioned processes. I had no clue who that might be. But God had someone in mind. In the 1970s I sang with a band named Selah (not the current group that performs under that name). We were, instead, one of the pioneer Contemporary Christian Music groups. Our drummer was a talented musician named Paul Turner. By the time Toby, Adrian, and I were wrapping up the writing of the book I hadn’t seen Paul and his wife Leslie for maybe 25 years. I posted one of my chapters on Facebook to bounce it off of my friends. Leslie happened to be one of those who saw the post and messaged me about her publishing company and that she would like to see more of the book. I sent her the not-quite-finished manuscript and after reading it her passion for how the book could change lives matched ours. Leslie grabbed hold of all the tactical tasks that I was no good at and ran the ball through publication with her company Encourage Books. My very talented graphic artist daughter, Jen Hanson, gave the cover design the provocative, shadowy tone I was looking for. World-renowned illusionist, author, and evangelist Andre Kole, with whom both Toby and Adrian had toured, provided the Foreword to the book and more than a little encouragement and excitement about the book. The book is dedicated to Andre in honor of his inspiring friendship with all three of us over the years. And then, there was one more surprise turn along the pathway—one none of us saw coming. Adrian and I live in Tucson, AZ, so we’ve done many shows together. But Toby lived 3200 miles away in Ecuador where he was serving with a Christian school. About the time the book was in the final editing stage in late 2016 I received a call from him. Of all of the Christian schools in the United States he had been asked to interview for the position of Headmaster at one in Tucson. My immediate response was, “God, what exactly are you doing here? Does this have anything to do with the book?” I mean, what are the chances? Tucson, of all places. In December Toby, his wife, and their daughter moved to Tucson. In January we presented our first Unmasking the Masquerade LIVE! event together—me performing mentalism, Toby speaking, and Adrian performing magic and sharing his personal testimony; essentially, the book on stage. That same month, Unmasking the Masquerade: Three Illusionists Investigate Deception, Fear, and the Supernatural, arrived from the printer. Testimonials we are receiving from readers are confirming that God is working in people’s lives through the book. One reader said that after reading the book she cancelled a “psychic cruise” she had booked. Several readers shared that it helped liberate them from unfounded fear of Satan or that they are now better equipped to avoid deception. I told my wife recently that I’m glad now that I didn’t know how difficult and time-consuming writing a book would be. Had I known when I took the first step on this multi-year journey how hard it would be, I would have turned back. Which is probably why God didn’t let me know. Because now that the book is finished I couldn’t be happier with the destination. I share this story with you because you may find yourself somewhere along your life’s journey – pursuing a passion but wondering if the road will be too difficult, or finding that the many twists and turns are simply too confusing. Well, I can’t tell you if your passion is a God-given one; that’s between the two of you. But I can encourage you that if it is His direction for you, rest assured that the doubts are just a deception, that when the steps ahead of you seem confusing and difficult, give your fears to Him, and trust in His supernatural ability to see the entire pathway ahead of you and prepare your way. I love this, Rod. Rendering your powerful book to the shelf, then SURRENDERING it to God as you picked it up again, listening, always listening to God’s leading, is such a testimony. Imagine if you had forced it through to publication all those years ago when it wasn’t yet where God wanted it to be! Imagine if you had given up hope and left it on the shelf! When people read your book, the masks are pulled off and they can really see, some for the first time, the Messiah. I know you, Adrian and Toby have made tremendous sacrifices, and continue to do so, for the message in this book. I’m very proud to have played a part and know you are just at the beginning of the journey.